September 12, 2017 – 1:00 P.M. 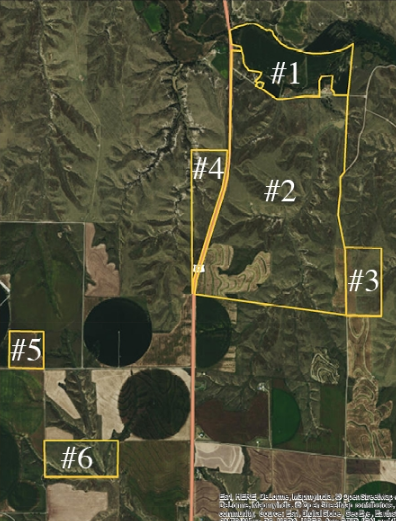 Details: The Red Willow County Assessor’s office has a total of 1,278.97 taxable acres on all six parcels combined. The total acres including the 2 feedlots, roads and waste and old building sites total 1,278.97 measured acres. This estimate includes 35 acres of rangeland in Parcel 1. This can only be isolated more closely with a survey should Parcel 1 and Parcel 2 sell separately. According to the Red Willow County Assessor’s Office there is a total of 984.79 acres of grass, 148.87 acres of drycrop, 15.46 acres of roads, 122.40 irrigated acres and 7.45 site acres on all 6 parcels combined. If Parcel 1 is sold separately it will need to be surveyed. It lies north of Road 725 and east of Highway 83. This parcel has 2 pivots that irrigate a total of 82.75 according to the Red Willow County FSA. There is a Valley Pivot that lies to the west side of the field that is serviced by a well that is north of Red Willow Creek and off of the boundary line of the property. This well has an easement via the will of William E. Koetter. The east pivot is a small Reinke pivot that is owned by the tenant. It will be up to the buyer of the property to decide and negotiate with the tenant as to the purchase of the pivot. The east pivot is serviced by a well that is on the south side of the field. Said well also had underground pipe to irrigate 17.87 FSA measured acres on the east side of the property of Parcel 1. There are 2 Husker Harvesters on the premises and it is not known if they are operable. There is no irrigation pipe that goes with the property nor is there any livestock equipment that currently is present on the property included in the sale. This personal property belongs to the tenant. The East feedlot is included with Parcel 1. There are 2 submersible wells on this property, one well is included with Parcel 1 and one well is included with Parcel 2. This is to provide water to the rangeland that is in Parcel 2. The previous tenant has run a hose across the road to water tanks in the pasture land located in Parcel 2. There are a total of 169.40 surveyed acres in Tract 1. There is 122 certified irrigated acres according to the middle republican N.R.D. There is 82.73 pivot irrigated acres. There is 38.96 acres that could be flood irrigated. Parcel 2 consists of hardland pasture with some drycrop. It is bordered by US Highway 83 on the west side of the property and partially bordered by County Road 385 on the east. Parcel 2 is watered by 1 windmill located approximately in the center of the rangeland. Parcel 2 also has 1 submersible well north of County Road 725. The tenant previously had run a hose from the submersible well in Parcel 2 under County Road 726 to fill tanks to water cattle. There is also a stock dam located on the northeast corner of the property. Also included in Parcel 2 is some rangeland north and west of 2 Husker Harvesters that are located north of Highway 725. The west feedlot is included in Parcel 2. FSA has measured 98.72 drycrop acres in Parcel 2. There is a total of 940.49 total surveyed acres in Tract 2. This would mean that there would be a total of 841.77 acres of Range in Tract 2. Parcel 3 consists of 53.44 FSA measured range acres and 15.01 drycrop acres for a total of 68.45 acres. Again, this is acres measured by the Red Willow County FSA. There is an alleyway on the north side of Parcel 3 that allows cattle to go to the windmill located in Parcel 2. Previously there was an arrangement with a relative to the south to use a water source for the south end of Parcel 3. This is not an easement and arrangements would have to be made by the buyer should Parcel 3 be sold separately with a neighbor to water the livestock pasture in Parcel 3. This parcel is adjacent to County Road 385, providing great access. Parcel 4 is 78.03 FSA measured range acres located west of US Highway 83. It is also west of Parcel 2 across Highway 83. There is not water source on this range/pastures. Previously there was an arrangement with a relative of the family to obtain water from a windmill located on the west side of said Parcel 5. However, there is no arrangement currently in place. A potential buyer would have to provide a water source or negotiate with the owner west of the property to use his existing windmill for a livestock water source. Parcel 5 consists of 34.74 FSA measured drycrop acres and 4.95 off season grazing pasture. This totals 39.69 acres. It is accessed by County Road 723.